Do you need your wooden floors repaired? 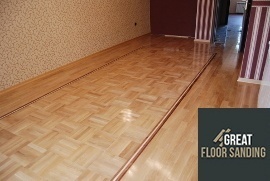 Looking for means to refresh your interior and also eliminate some imperfections in your wooden floors? Then contact Great Floor Sanding and book our first-class floor sanding London service for your home or workplace. 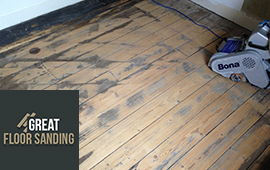 The floor sanding experts have the experience and equipment to tackle any project in London. Among our customers have been private residences, schools, retailers, business buildings and restaurants! This diversity extends to the materials we have worked with: parquet, cork, softwood and the classic hardwood. What we provide is a completely custom-tailored service just for you. Before commencing with floor sanding and restoration, the experts visit your space to examine the floor and see its general condition. From then on, we build a battle plan as to how to work the wood and enhance your floors’ appearance. All materials and products used are based on all-natural recipes – safe for pets, infants and people with respiratory conditions. We work efficiently thanks to the high quality BONA equipment that leaves little residue behind. Why Opt For Our Wood Floor Sanding in London? There are many reasons our wood floor sanding London service is the right choice for you. As one of the most iconic building materials, wood doesn’t only serve a function, but has an integral role into turning a property into a home or the heart of any business. Wooden floor designs communicate affluence and success. In living quarters, wooden floors bring comfort and warmth. In places of business, they communicate exclusivity and a higher standard. And when you need to take care and maintain them, turn to our service for wood floor sanding in London to keep them looking impeccable. Longevity – A high quality finish can prolong the life of your wood floor which, with the right care, can up to a hundred years. Warm and homey – Sometimes a good hardwood floor is all it takes to achieve the desired hominess of a place. Hypoallergenic – The best part about a quality wooden floor is it goes easy on allergy sufferers. Unlike carpeting, the wood floor doesn’t accumulate pollens, dander, mold and other unsanitary agents. Easy to maintain – All it takes is some sweeping and mopping to keep your wood floor in a clean and presentable state. Higher home value – According to estate agents, properties with quality wooden floors sell much easier in comparison to spaces with other types of flooring. A timeless appeal – A hardwood floor will remain a classic choice throughout the centuries to come. You will be happy to learn the floor sanding company can provide you with a no-obligation on-site consultation. Either call us, chat directly with our customer care advisers, or use our online contact form to make an appointment. We are unable to give you a fixed price for the job until we take a closer look at your wooden floor. The sanding is one thing, but the floor might require additional repairs so it’s best we see it ourselves. Then the specialists will be able to give you an estimate and you can decide whether you want the job done. How Can The Floor Sanding Experts Help Your Wood Floors? Repair: Takes care of slightly or heavily damaged floors with a focus on masking any damage that has occurred to the floorboards. This includes replacing boards where applicable and possible. Restoration: A service geared towards rejuvenation. Sealing, waxing, and oiling: Service dedicated to applying the final finish that acts as long-term protection against wear and tear. Staining: Service geared towards coloring the wood with hues that better match with your decor. Gap Filling: Identifying and filling all gaps to minimize creaks and spots that cause drafts and pump your utility bills. Floor Fitting and Installation: For wood floorings beyond repair, the experienced floor fitters in London can help you with the selection and the fitting of your new flooring. We know how to fit all types of hardwood, softwood, laminate and parquet floors. For the full list of services we provide you can visit the What We Do page. 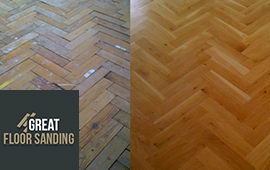 The London floor sanding team consists of remarkable experts who have many years of experience. They are professionally trained, vetted and insured. All the operatives are Bona certified so you can be sure we work in accordance with the highest professional standards. Book Our London Floor Sanding For Your Property Today! The fastest way to contact us is to dial 020 3404 9697! To make sure we’re always there for our customers, you can contact us every day from Monday to Sunday 24/7. This also includes common bank and national holidays. Our courteous support staff will answer your call, handle questions about the service, arrange an on-site inspection and book a service for you!